Q: Who are the authors of this website? A: Christopher Russo (that's me) acts as the writer/compiler/editor/whatever/graphic artist of the VEX. "Voltayre" is a fictional character (a novice technomage, to be precise) and doesn't really do anything except bug me at the most inconvenient of times. A: Special thanks goes to Kurt L. Reisler for providing scans before I got a Snappy of my own. Also to Mark Higuera for providing corrections and grammatical support. And to countless others for their suggestions and corrections. Thanks! Q: Can I Link my page to the VEX? Q: Will you link to my page? A: If it's related to B5, I'll place your page in the appropriate category on the Links page. All you have to do is ask; although I do accept bribe money. If you have submitted one before and it isn’t on the Links page, please re-submit it as it had probably gotten lost. Q: What does this symbol mean? A: The kogash skull denotes an extinct species. A: The fiery circle surrounding a Mayan death hand is used to denote an ally of the Shadows. A: The stylized triangle denotes an ally of the Vorlons and/or a member of the Army of Light. Q: Where do you get your information? A: A lot of official sources: the episodes themselves, comics, novels, magazines, the RPG, B5 Wars, micromachines, and JMS on Usenet, AOL, Genie, & Compu$erv. Anything I can get my hands on. Q: OK, but how come there's stuff I've never seen? A: Good question. Compiling all this information can get... boring, and frustrating. So when I see an article with very little or no information about something from a novel or a very minor background element, the voices tell me to take creative license. (One cannot disobey the voices... ) If you're looking for canon material only, check the Notes page. Those articles with my illustrations and ideas are marked and you can avoid them if you wish. Q: How come there aren't profiles for all the characters in the show? A: J. Michael Straczynski. Creater, writer and executive producer of the television show, "Babylon 5". Also known as the Great Maker without whom watching television would be that much bleaker for the last 4 years. And TNT would be that much poorer without the five years subscription I'll have to buy to continue with the story. Q: Has JMS seen your site, and what does he think? Q: Can I download this in a text file? A: No. Sorry, for one I can't spare the time to make a new file every time I add to the site. Further, the megabytes I have available are inadequate. Q: Is this available in book format? Q: Why aren't there any episode synopses? A: A great number of sites have that area covered (foremost being the Lurker's Guide and the Official Babylon 5 Site) more than adequately. Q: Has the VEX won any awards? A: The VEX has won four awards! Awards are as follows: Cool Site of the Hour (2am, Sept. 20, 1996), Geek Site of the Day (Sept. 20, 1996), a 4-star rating from Magellan, and the Shakaar Top 5 Site for December! In addition to Net Awards, Voltayre's Encyclopedia Xenobiologica has been mentioned in Sci-Fi Flix (September 1996), Sci Fi Entertainment (February 1997), TELE (Mar 15-21, 1997). The VEX was also reviewed by Science Fiction Weekly (April 6, 1997) and named their Sci-Fi Site of the Week! The July 5-11 issue of TV Guide lists the VEX among three others in an article by Jose A. Martinez. 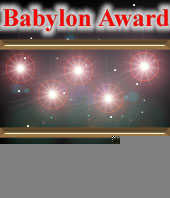 On October 21, 1997, the VEX was selected as one of the Best of B5 related sites by Best of Babylonia.The VEX is featured as a “Click Pick” in the Babylon 5 section of Your Personal Net Sci-Fi (Michael Wolff, ed., Dell Publishing, 1997). The VEX may be featured in a future broadcast of “Wild, Wild Web,” an upcoming issue of StarBurst, and Sci Fi Universe. Q: What about copyrights and all that legal stuff? A:Babylon 5, characters, names, and all related indicia are trademarks of Time Warner Entertainment Co., LP. ©1998 Time Warner Entertainment Co.
Voltayre's Encyclopedia Xenobiologica is a trademark of iNFiNiCorp Transgalactic and Christopher Russo. The Voltayre’s Encyclopedia Xenobiologica logo is a registered ® copyright of Christopher Russo. All of the original images in this archive are copyright Christopher Russo, 1995-98. Permission is granted for their viewing over the World Wide Web, and for links to be made to them; permission is not granted for copies of them to be placed on other sites, or for copies to be placed on other media including, but not limited to, CD-ROM archives. All of the text (including the Web pages themselves) in this archive is copyright Christopher Russo, 1995-98. Permission is granted for its viewing over the World Wide Web, and for links to be made to it; permission is not granted for copies of it to be placed on other sites, or for copies to be placed on other media including, but not limited to, CD-ROM archives. Comments, criticisms, suggestions, and additions welcome! Post them here. Babylon 5, characters, names, and all related indicia are trademarks of Time Warner Entertainment Co., LP. ©1994-98 Time Warner Entertainment Co. All original text, artwork and page design ©1995-98 iNFiNiCorp Transgalactic/Christopher Russo.